Today I wanted to share a few layouts I made using the Stella Workshop on the Go Kit from Close To My Heart (CTMH). For those that don’t know, CTMH offers these wonderful kits that contain various designer paper from their exclusive paper lines as well as cardstock, some embellishments and even some stamps that are exclusive to the kit. The kit cost 29.95 and can be purchased HERE. One of the things the kit comes with is a full color tri-fold brochure with step by step directions on how to complete their idea. Here is a picture I took. It still doesn’t do the kit justice. Underneath the brochure is a whole page of Chipboard hearts. Like I said, the brochure gives you an idea of what to do with the kit and some step by step directions. Here is one page of the brochure detailing some instructions on assembly. Here are the two layouts and additional bonus project that you can create with this kit. To create this first kit you will need your inks and the alpha stamp set. To create this second page you will again need some inks and the alpha stamp set in addition to the kit contents. For this bonus project, you will need the inks and the envelopes in addition to the contents of the kit. I think these workshop on the Go Kits are a fabulous idea. So here is what I came up with using my Workshop on the Go Kit. Close up of the Stamped Chipboard Hearts and the Title Block. I used the “top of the chair” stamp to stamp the pretty floral pattern on the hearts. I sponged ink around the edge of the cardstock rectangle and then stamped the stitching around the edge and then stamped the sentiment. 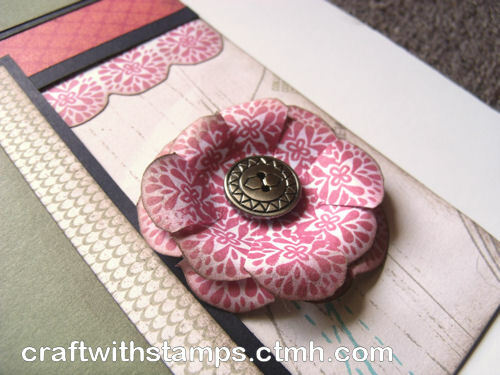 Close up of the flower I created using the stamps as well as the pretty floral scalloped border. I also stamped a thin border of “stitching” to give it a finished look. The pretty doily and brass button are part of the kit. Here is a close up of one of the “flowers” I made using one of the stamps in the set along with some Hollyhock Ink. I also used some Chocolate Ink to ink the edges for a little bit of a distressed look. You can also see towards the top the border I created using the same stamp and ink as the flower. Here is a close up of the three hearts that I used the texture tool in conjunction with the Lagoon, Hollyhock and Brown Bag Inks to create this “marbled-stone” look on the chipboard hearts. Here is a close up of the I heart. I simply sponged some Hollyhock ink onto the chipboard heart and then inked the edges with some Chocolate ink. The pretty lace-doily flower and button are a part of the kit contents. The really nice thing is after completing these three layouts, I still had some extras. I will make a card or something with them and then show you that as well. So all in all, these Workshop on the Go Kits are a fantastic value. Along with making three layouts and having extras, I will have the stamp set that I can continue to use again and again! PLUS you would qualify for the FREE Perfect Pairs Promotion where you would get a paper pack and matching embellies free as well as the Stamp of The Month for only $5 more! As an added bonus, purchase $20 or more from my CTMH link during July and I will send you a voucher for $10 worth of downloads from PaperCraftingWorld.com! For those that are interested and make a Stella Workshop on the Go Kit purchase from me, I can send you complete directions on how to make these three layouts including cutting dimensions, etc. :). Thank you so much for stopping by and making us a part of your crafty time! Have a wonderfully crafty day! Melinda I love what you did with the workshop - those flowers are stunning!